I actually completed this program in 2013 with my grandson, but misplaced the booklet and badge. 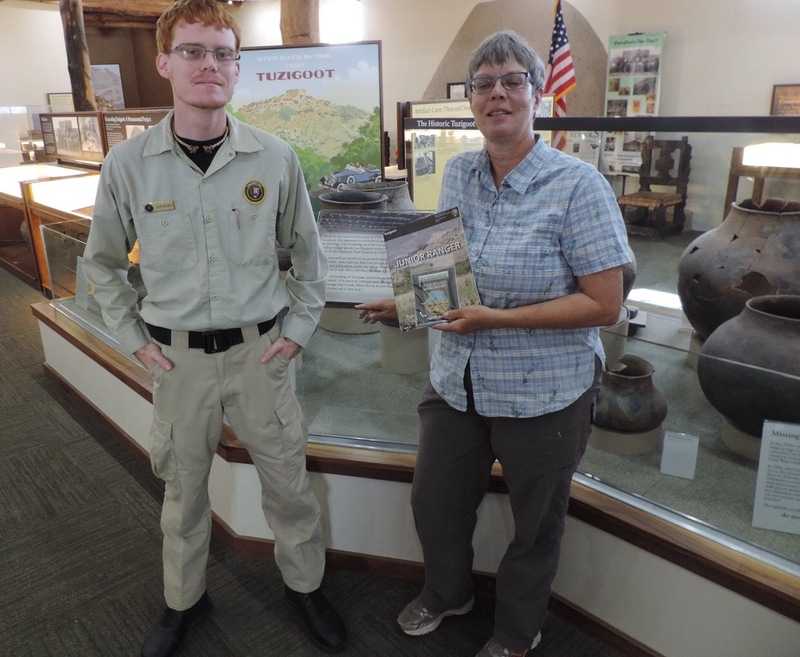 I cherish the time I spent working on this with him, but wanted to have a replacement booklet and badge for this blog, so I worked on it while on my way to and from the Grand Canyon National Park this summer. This park has ruins from 1300 CE when the Sinagua people inhabited the area. What makes these ruins unique is the ‘island’ of rock which the ruins are scattered along and many are accessible or at least easily seen from a one-mile trail which encircles the island. As this park sits at 7,000 feet and you have to walk down 185 vertical feet on stone stairs you need to carry water and be in good health. Not all of the ruins can be seen along the trail. 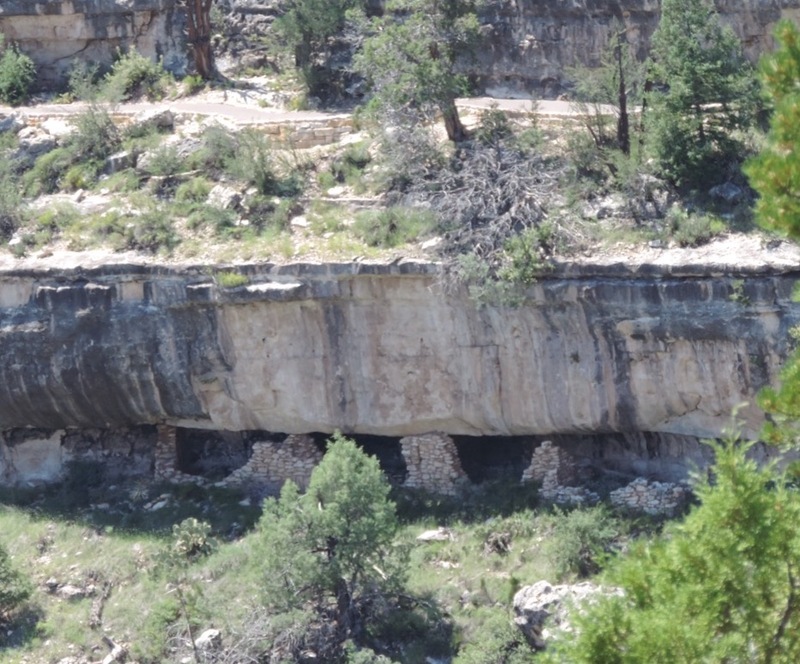 The picture above shows some below the trail, these could be seen from a trail along the rim from the visitor center. Three age groupings and their icon: Ages 7 and under – Horned Lizard, Ages 8 to 11 – Squirrel and Ages 12 and up – Raven. Each group is to complete the activities matching the icon showing on each page, with each group having three activities to complete. 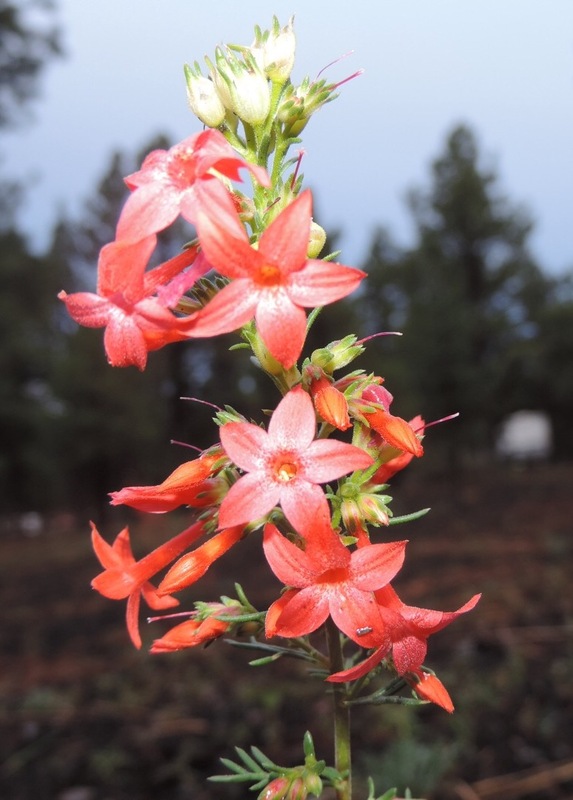 Activities are; Trekking In and Out of the Canyon, Plant Hunter, Canyon Puzzler, A-MAZE-ing Trails, SENSE-ational Walnut Canyon, To Protect and Preserve, Park Rangers at Work, Where in the Canyon, Identify a Tree, Respect to Protect and Notes from the Edge. The last two activities are for all ages. 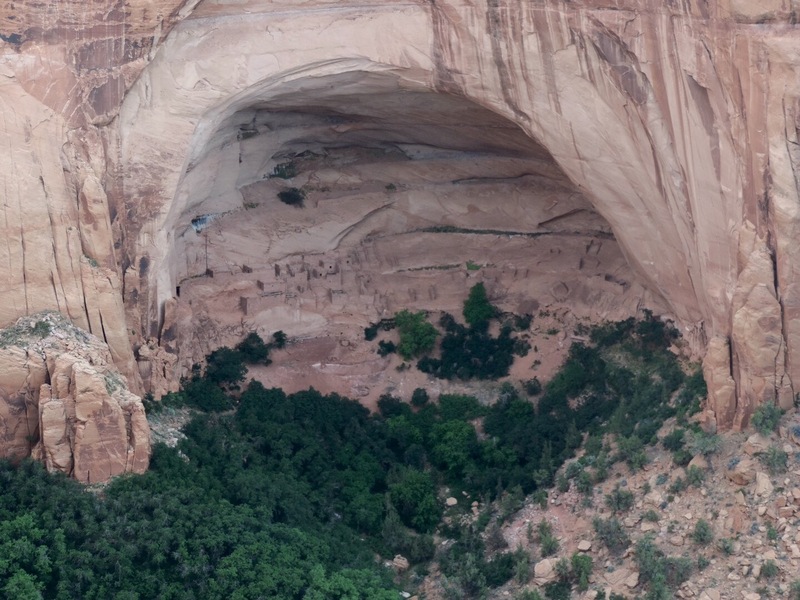 The Raven activities are; Canyon Puzzler, To Protect and Preserve and Identify a Tree. I always enjoy completing a crossword puzzle based on the park, much more than a word search. I always learn something from the clues. To Protect and Preserve was interesting, using a word bank, blanks are filled in to reconstruct the proclamation that established Walnut Canyon National Monument by President Woodrow Wilson in 1915. Wow, this site was established a year before the National Park Service was created from the Department of the Interior. Identify a Tree is a great resource, besides helping me identify a Ponderosa Pine while visiting, it will help to identify other trees in the future. It uses a method of yes and no questions which create a key leading to six different trees found in this area, and throughout Arizona and the Southwest. On the day I picked up the booklet a ceremony had just finished dedicating a plaque honoring Stephen Tyng Mather, considered the founder of the National Park Service. Not every site has a plaque, many were placed in the 1930s, again in the 1960s. 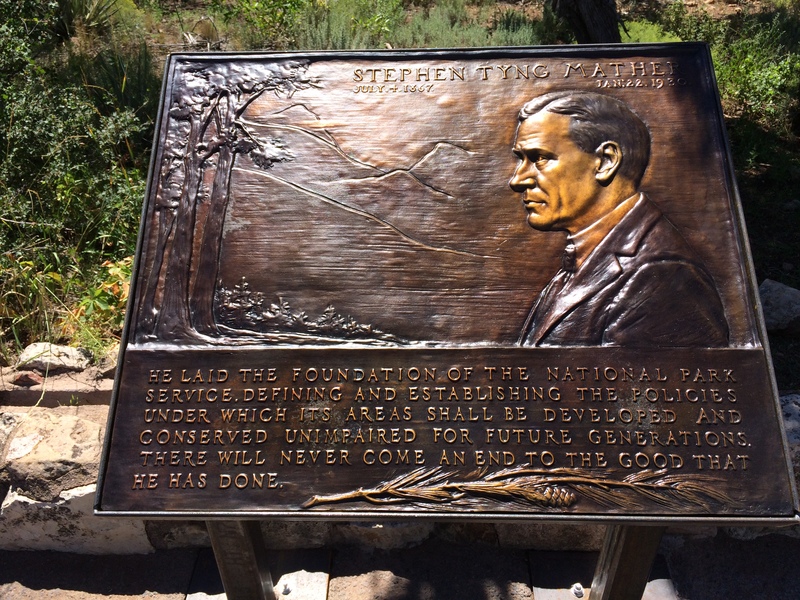 The NPS Centennial in 2016 renewed interest in placing these plaques at more parks. Through private donations this plaque was installed on August 25, 2017. We missed the dedication, but enjoyed some cake. A few days later I returned with my booklet completed and received their beautiful wooden badge. This wooden badge is sturdier than other wooden badges I have received, probably not walnut, though. 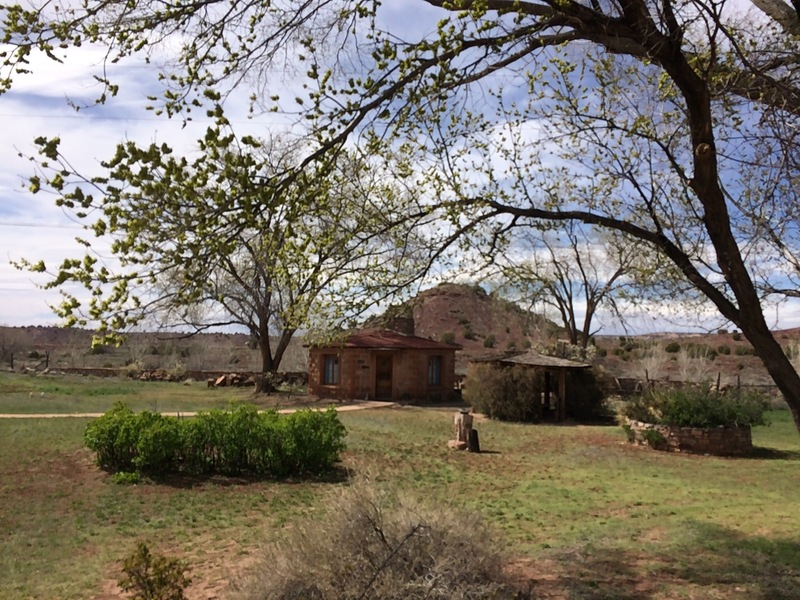 A visit to Hubbell Trading Post NHS is a step back in time, a time when this trading post would have been bustling with locals, brought by horse to trade their goods for supplies. 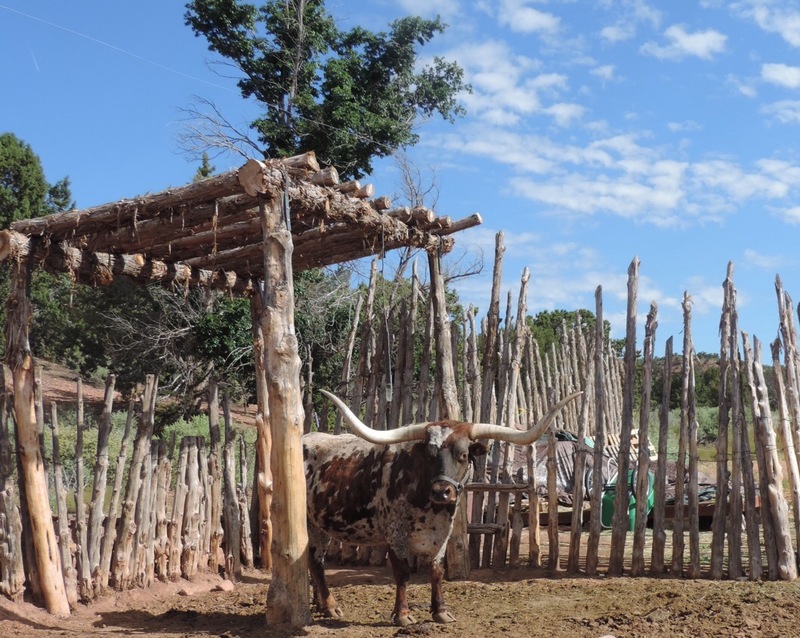 This site has been active since 1878, and still serves the local Navajos as a place to buy goods , as well as trade or sell their crafts. You can walk into the trading post, buy some of the traditional items, such as blue cornmeal, hand-woven rugs and exquisite jewelry, as well as modern snacks and drinks. There are not a lot of buildings open to visit, without being on a tour, but the grounds are relaxing to stroll through. The visitor center is along the road into the site and has some interesting displays. I picked up the booklet from the ranger on duty. The downloadable booklet linked above is a different booklet, it has more activities with better graphics. Both booklets only require completing four activities and neither give an upper, or lower age. I completed all four activities; Visitor Center Facts, Matching Terms, Cross Number Puzzle and Navajo Rug. As simple as this booklet seemed to be, I have to say finding some of the answers was challenging. It caused me to read the displays very carefully. I really enjoyed the Cross Number Puzzle, using only numbers to fill in the grids was unique. Coloring the Navajo rug was fun. It probably took about an hour to complete the booklet I received. Having to complete only four activities, also in the new booklet will probably just take an hour, as well. 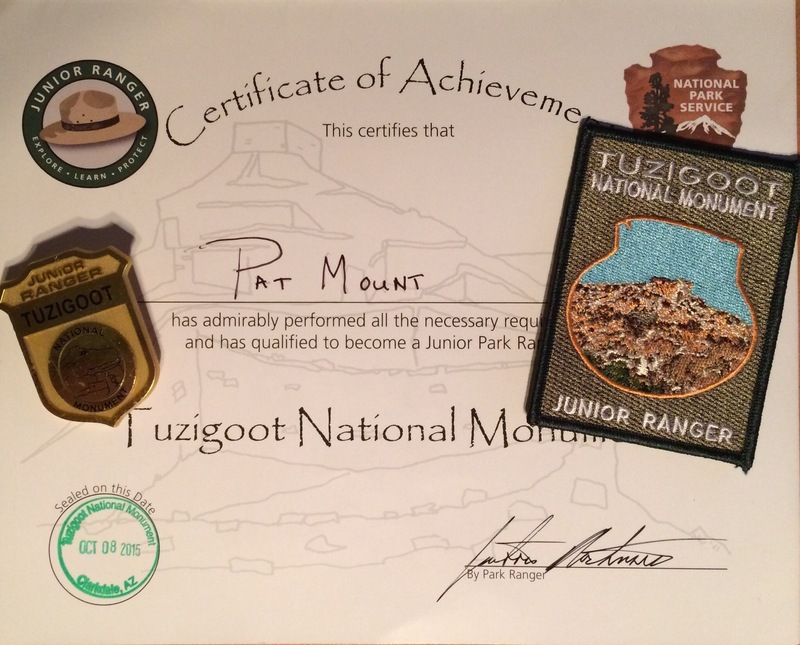 The ranger reviewed my answers, helped me with a few of the questions , then gave me a standard Junior Ranger badge. 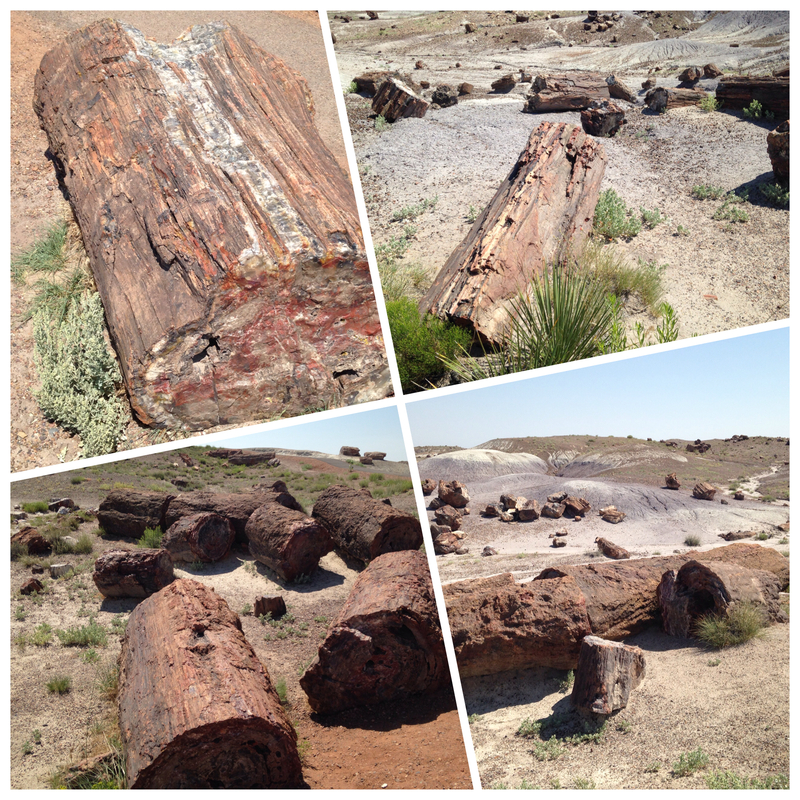 You won’t just find beautiful petrified wood as you explore this park, you’ll also find unique buildings, remnants of Route 66, as well as dinosaur bones. Hopefully, you can drive the entire park, south to north, or reverse. Plan to stop and explore along the way, there are great views and short hikes to enjoy. 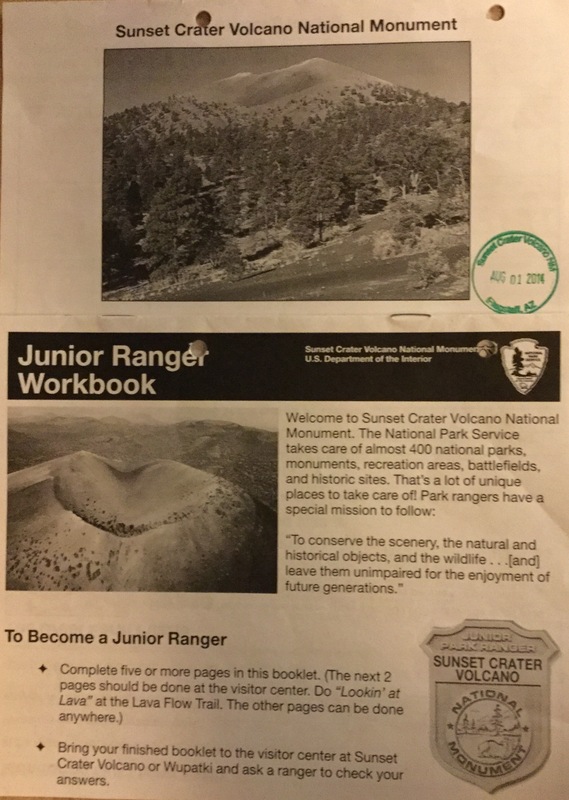 On a prior visit I had picked up a Junior Ranger booklet and worked on it before returning for this visit. Since picking up the booklet a new, with very nice and colorful graphics, booklet was issued. 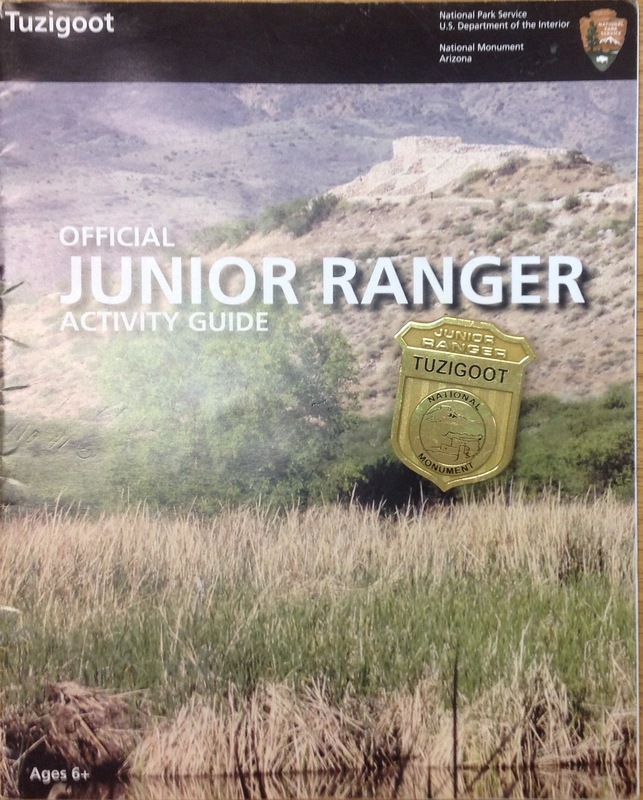 As I had completed the required number of activities listed in the new booklet I was awarded the Junior Ranger badge. This program is Senior Friendly as no upper age limit is given. The age groupings and requirements are; 6 years or younger complete at least 3 activities, ages 7 to 10 complete at 5 activities and ages 11 or older complete at least 7 activities. The twelve activities are; Experience Your America, Wildlife Watch, Archeology, Petrified Forest Crossword, Trail Explorer, Animal Adaptations, How Old Are These Things?, When We Left Home, No Bones About It, Petrified Wood Detective, Even More Spectacular, and Jr. Ranger Field Notes. I always appreciate when there are more activities than required for the upper age group, so I can pick and choose. 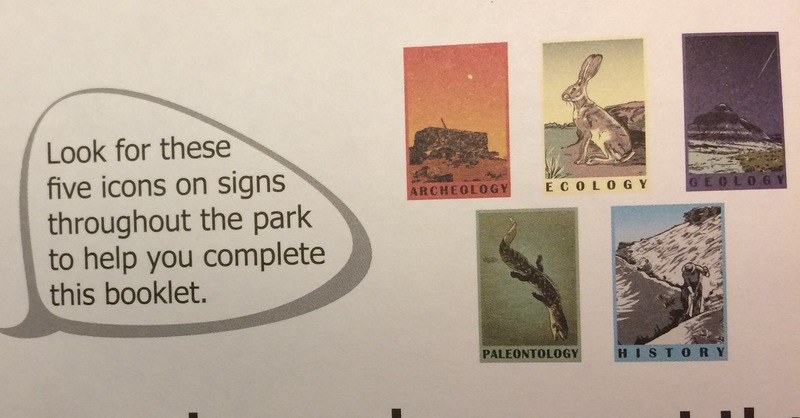 A unique feature of this program are the icons that can be found on park signs that match activities in the booklet. This is a big help as you travel and stop at the many interesting places, it alerts you to find a matching activity. I hope other parks add this feature to link their Junior Ranger activities to park signs. As usual I enjoyed Wildlife Watch, as I find being alert for the local animals and their signs keeps it interesting while you are in a park. It makes you focus on what is out there, not just the activities in the booklet. On this trip I only saw Ravens and Lizards, I hope on a future visit to see Pronghorns. No Bones About It was a great activity while visiting the Rainbow Forest Museum, at the south end of the park, and use the information displayed to answer the questions. Petrified wood is the reason to visit this park and Petrified Wood Detective allows you to get up and personal with a piece of wood and record what it feels like and the colors in the wood. Of course, while visiting the park it is OK to touch the wood, but not to remove it. 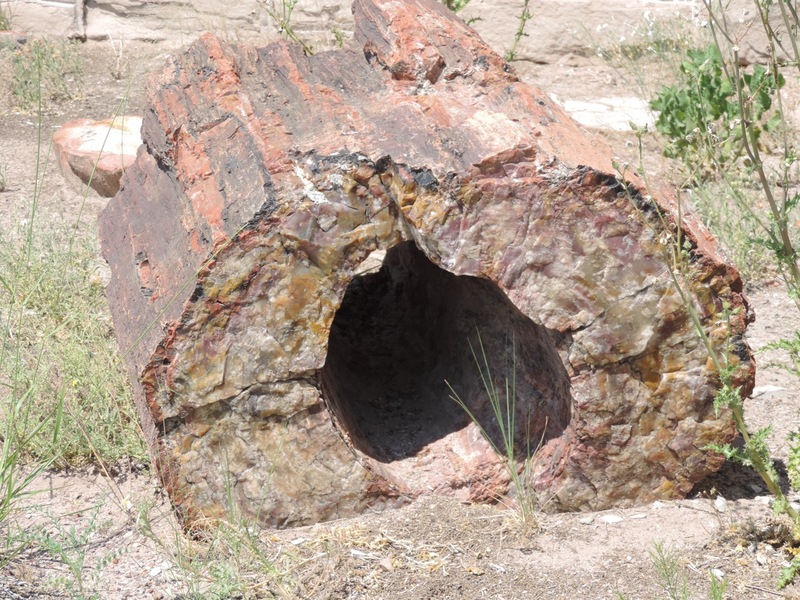 As you enter and exit the park a ranger will talk to you about leaving all petrified wood in place. 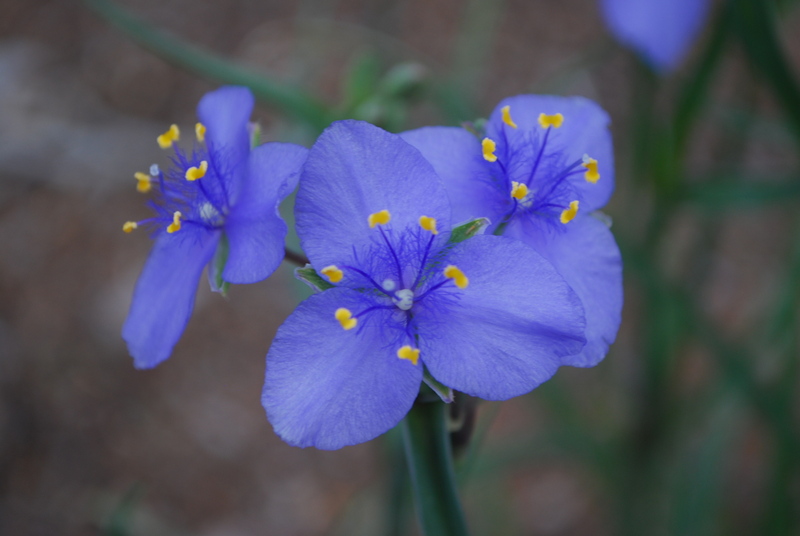 But, while out hiking in the park, spend time looking and touching the wide variety of textures and colors. 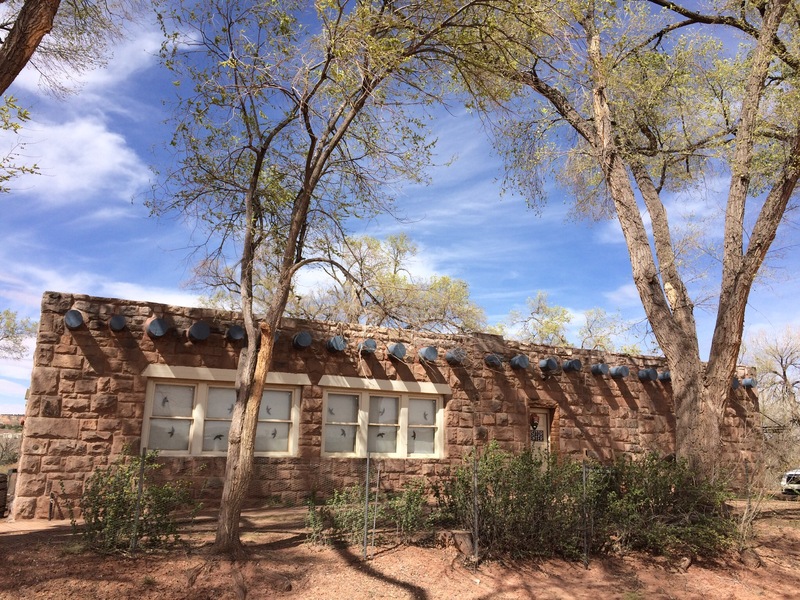 While driving the tour route I finished the booklet and stopped at the Painted Desert Inn, a beautiful building constructed with petrified wood in the early 1920s. The murals painted inside the rooms are gorgeous and well worth stopping to see. The ranger on duty reviewed my booklet, gave me a copy of the new booklet, had me recite the oath and awarded me their attractive enhance badge. The badge is shiny and depicts a landscape with a rising sun with petrified wood in the foreground. So much to see, get out and explore! Almost in my backyard, at least in Arizona, but 475 miles northwest and in an entirely different ecosystem. The ecological diversity of Arizona is what I enjoy the most about living here. The distance might be a reason why this took so long for me to complete. I have visited this site numerous times over the years and always enjoy the wildlife seen while touring the grounds and Winsor Castle. 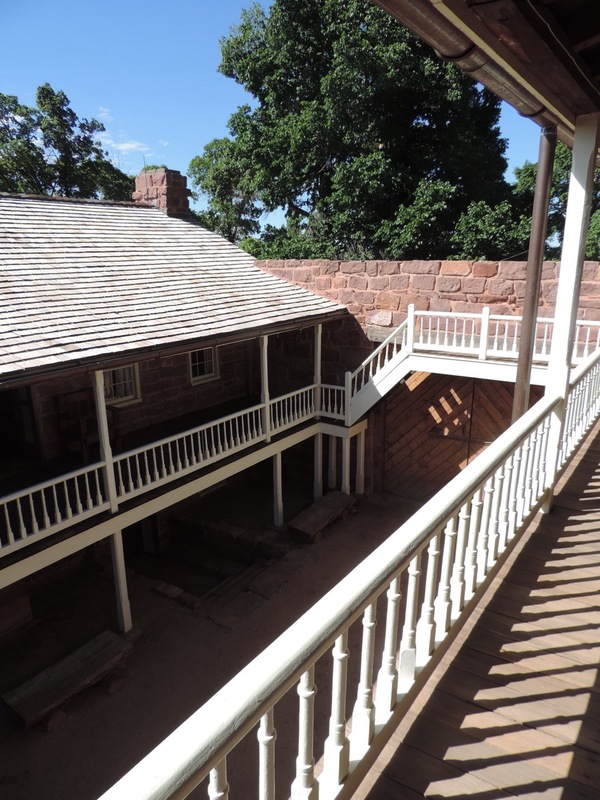 The building was completed by Europeans settlers in the 1800s, but the land was home to the Kaibab Paiute tribe long before their arrival. Note: I didn’t realize that I had previously completed this program and wrote a post last year. The 2016 Centennial Year was a busy year for me! This program is Senior Friendly as no age groupings are provided and the staff just expect anyone to complete at least five activities during their visit This allows you to complete the booklet without attending the tour of Winsor Castle, in case your travel plans don’t match with tour times. Activities include; Pipe Spring Scavenger Hunt (bingo format), Explore the Museum, Animal Tracks, Outside Tour, 1873 Supplies, Fort Tour, Match Present to Past, and Learning Paiute! The Scavenger Hunt has 12 pictures of items, plants or animals you can see while exploring the monument. 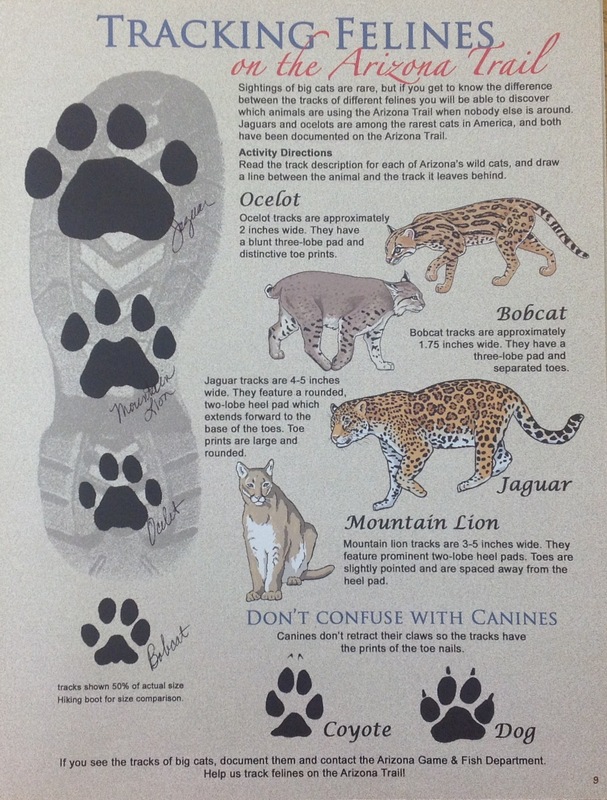 Lizards, ravens, and cottontail rabbits are plentiful in this environment and easy to mark off while exploring. I enjoyed the Explore the Museum because besides finding answers in the displays there were questions after each section which relate to your own experience. This allows you to think about the information and apply it based on your own experience. The displays also provide a good overview of the history; from the early Native American period through Mormon habitation and to today’s Paiutes living here. With some careful observation I was able to find lizard tracks in the dirt alongside the paced path behind the Visitor Center. Again the Outside Tour had you find information, but also asked questions for you to think about and answer. Visiting the pens of livestock, especially seeing the longhorn cattle was fun. The Fort Tour was led by a ranger and was excellent. 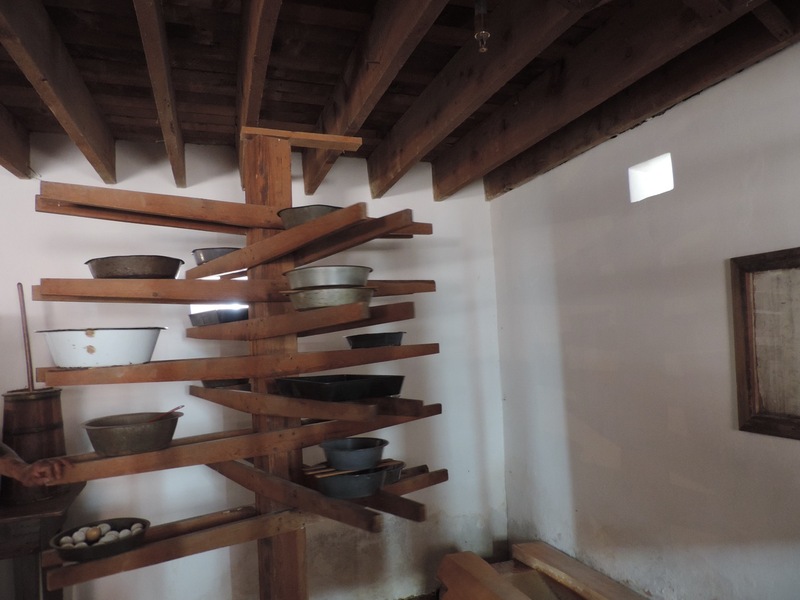 Besides getting inside Winsor Castle, the items on display give you a good idea of what it would have been to live here in the 1850s when the Mormon’s used this to supply themselves and others of their faith. Thanks to the springs there was readily available water, but this harsh environment on the Arizona Strip would have made daily life difficult. 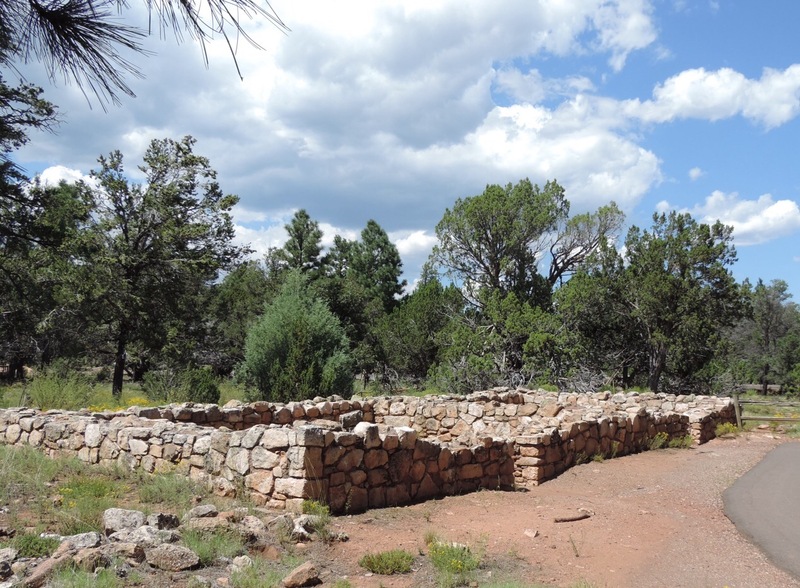 Before the Europeans arrived in the 1800s the Kaibab Paiute tribe had lived here for centuries. I appreciated the page which had you try to learn Paiute words, eventually having you write your own phrase with the words provided. 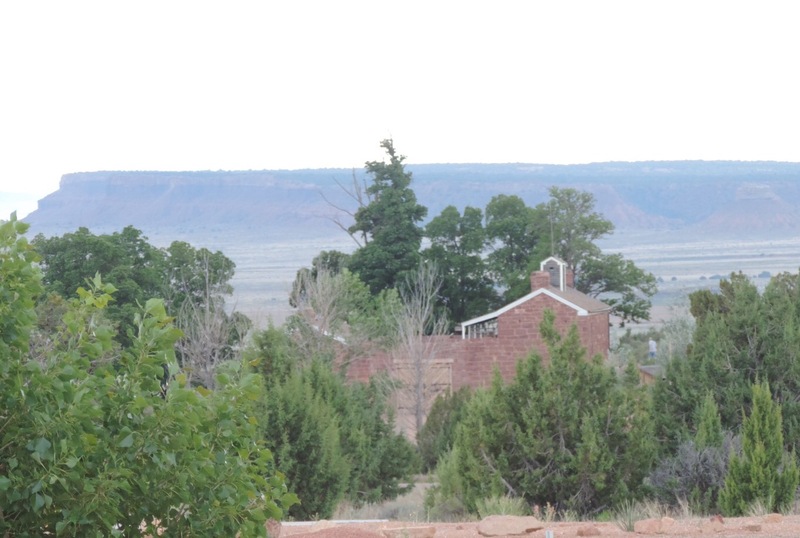 The monument is currently surrounded by Kaibab-Paiute tribal lands. The nearby campground is administered by the tribe. Once I completed the booklet I was sworn in by the staff at the entrance desk and given their enhanced Junior Ranger Badge which features the Winsor Castle. Pipe Spring National Monument is in the Arizona Strip, a northern section of the state that looks dry; this site is an oasis. The building, Winsor Castle, was built by early ranchers on land that the Paiute Indians called home for at least 1000 years. The visitor center and living history displays on the grounds tells the whole story from ancient times to the late 1800s. It is a great place to explore. This program gets the Senior Friendly rating as no age limits is given. I printed the booklet before I left home and was able to complete several of the activities before I arrived. 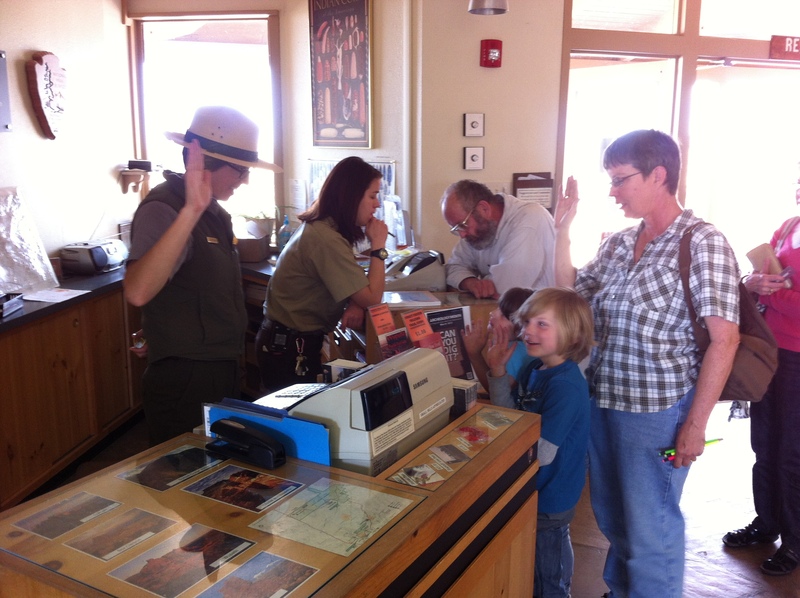 Once there I spent additional time in the visitor center and attended a ranger program to complete this program. 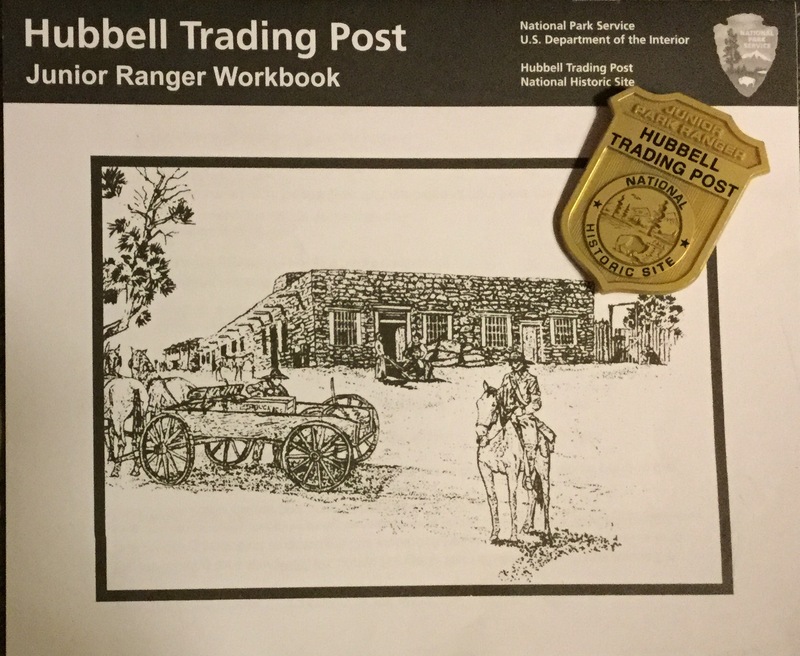 There is no requirement to attend a ranger program, however the information I learned helped me in completing the booklet. 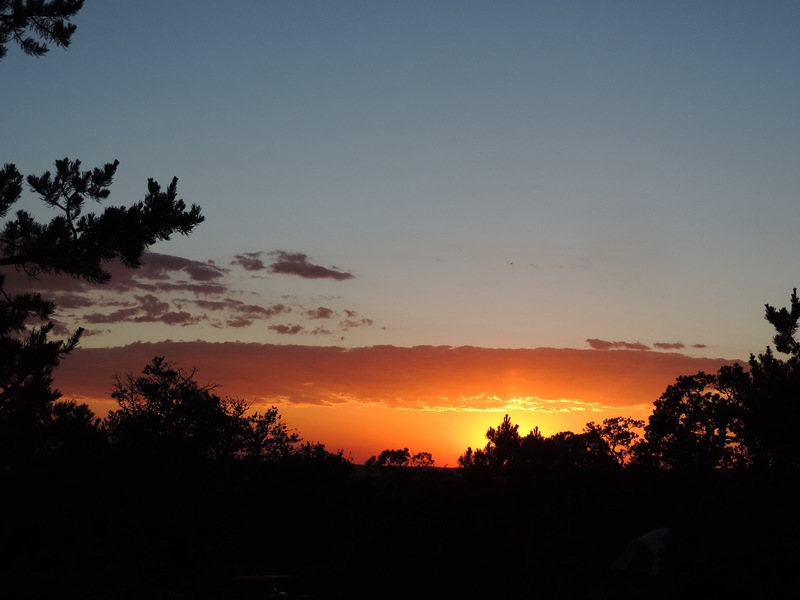 The activities include; Pipe Spring Scavenger Hunt, Explore the Museum, Animal Tracks at Pipe Spring National Monument, Pipe Spring Outside, Wagonload Supplies, Fort Tour, Match Past to Present, and Paiute Language. All of the activities gave me a better understanding of the history of this site, and of the natural environment of this area, including changes in water resources. The tour of the house with the period contents gives you a good idea what life was like in the 1800s. Once I completed all of the activities my booklet was reviewed by staff at the front desk. I appreciated their review and discussion we had to clarify some of my answers. 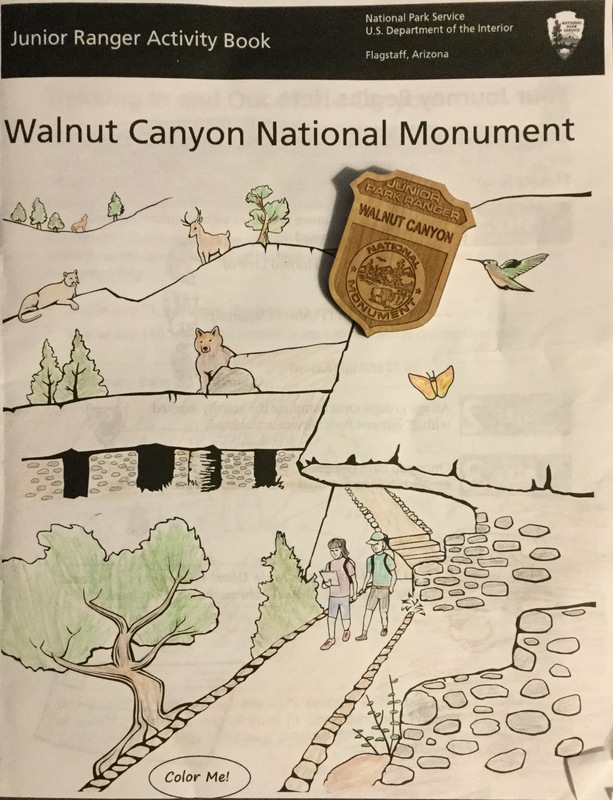 After reciting the Junior Ranger Pledge and stamping my booklet with their passport and NPS Centennial stamp I received an enhanced badge. The badge depicts an outline of Winsor Castle. The Arizona Trail almost runs through my backyard in Tucson, about 10 miles to the east. 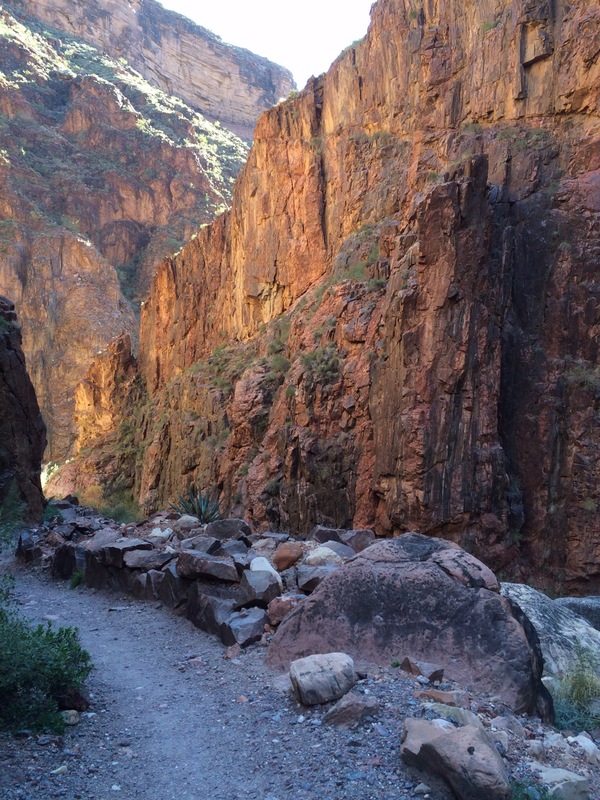 I have hiked short sections throughout Arizona; the whole trail is over 800 miles and reaches from Mexico to Utah. Hikers, bicyclists and horseback riders are able to cover the entire distance either as a through-trip (taking a long time) or done in sections. The trail passes through private and public land; public lands managed by state and federal agencies. 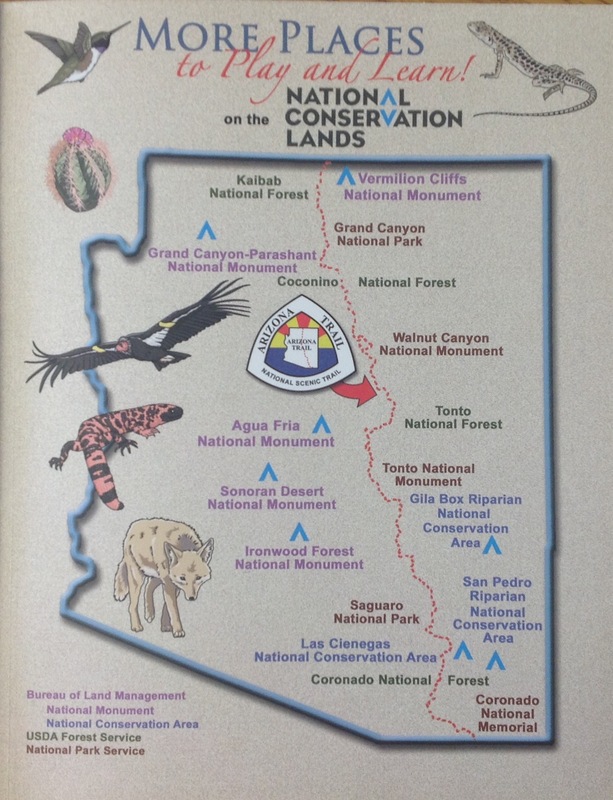 Some of the federal agencies are; Bureau of Land Management, US Forest Service, and Department of Interior. 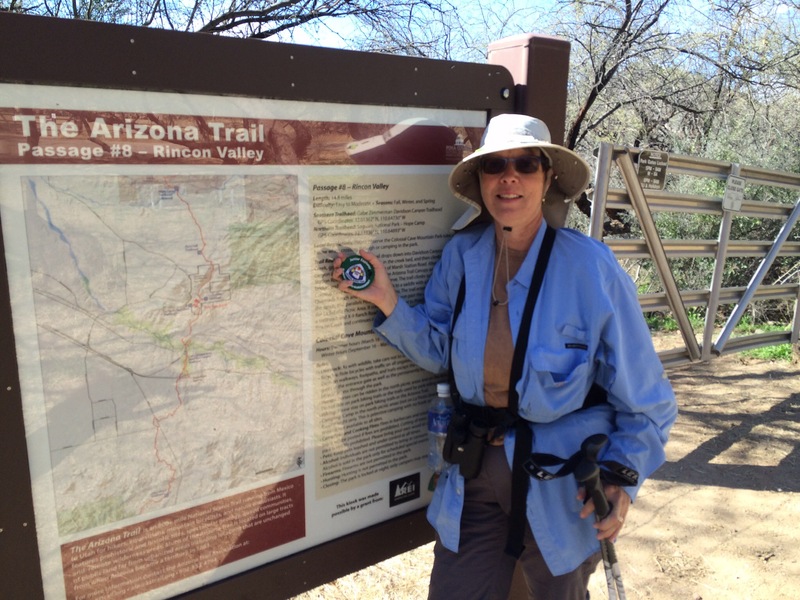 An important resource to enjoy the trail is the Arizona Trail Organization which can be reached at http://www.aztrail.org. This program has a a very attractive handbook with excellent graphics and detailed information about what you would see along the 800 mile route. 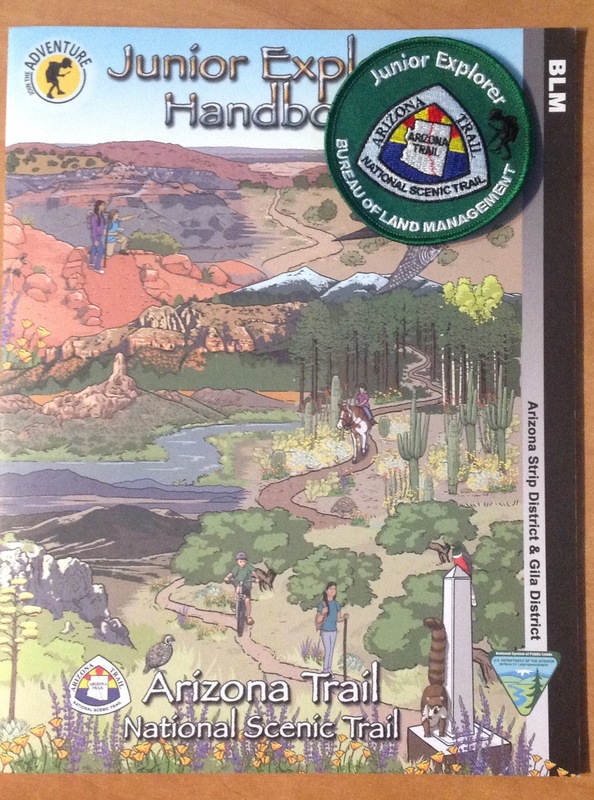 I was fortunate to find this booklet at the REI store in Tucson, however the entire handbook can be completed online. 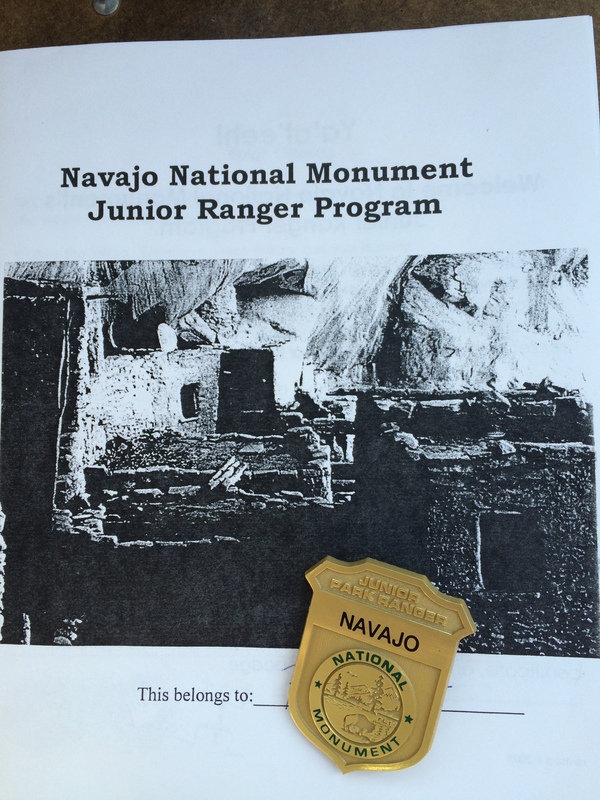 The BLM (Bureau of Land Management) provided this Junior Explorer program. It is considered Senior Friendly as no age range is given. With the information provided in the reading the material in this booklet is advanced. With adult help younger children could answer the questions and earn the patch. Another unique part of this program is your answers are submitted online. Once you complete the handbook and submit the answers an attractive patch is mailed to you. I was surprised when my patch arrived within a week. 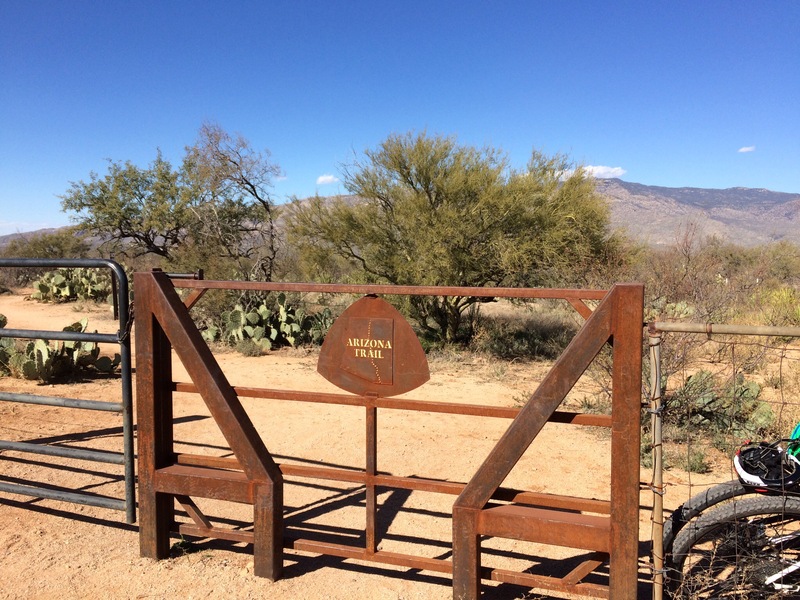 I celebrated by hiking a 3-1/2 mile section, Marsh Station Road to Colossal Cave Mountain Park. But before I earned my patch I had to complete the booklet. The trail for this activity begins at the southern border, the border with Mexico and works north. The page titles are; Arizona-Sonora Borderlands, Following Water: from top to bottom, The Sky Islands, Biotic Communities: along the Arizona Trail, The Gila River, Tracking Felines: on the Arizona Trail, Mogollon Rim, Cream-Filled Cookie:Plate Tectonics, San Francisco Peaks, Anatomy: of a Volcano, The Grand Canyon, Build Your Own Trail:along the Arizona Trail, The Arizona Strip, Create A Sound Map:along the Arizona Trail, Share The Trail: with other trail users!, and More Places: to Play and Learn. 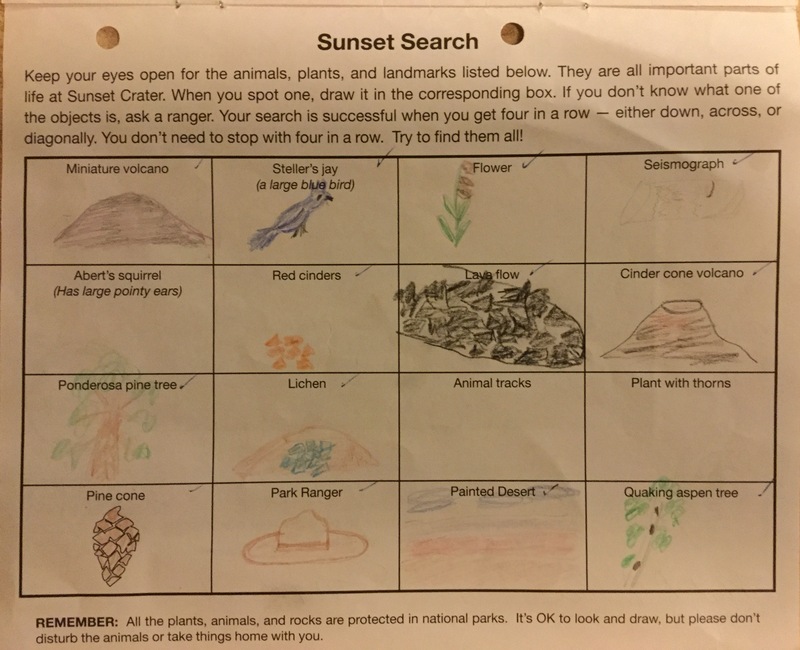 Not all of your answers will be submitted online, some drawing activities are included, as well as a demonstration of Plate Tectonics which you can eat after you are done! There are a couple of charts to complete and time spent listening outside to create a sound map. Only the online answers count towards earning the patch. I found answering all of the required questions nefoe I went online worked much better than The great part about this program is you can complete anywhere, without ever setting foot along the trail. 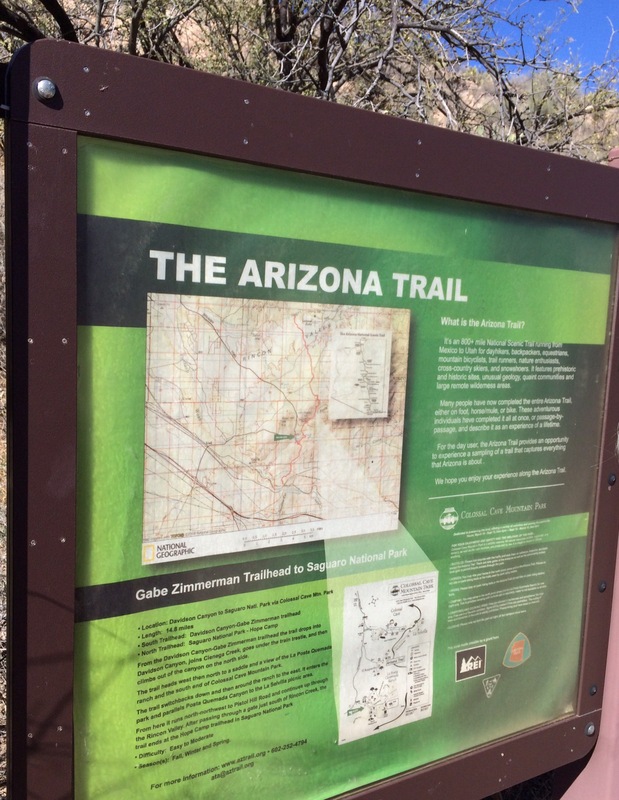 I think if you did do this program without experiencing the trail itself, you would make it a priority to visit Arizona and enjoy some portion of the trail in the future. A Junior Explorer Oath on the back of the handbook provides a certificate for you to complete. And as mentioned before, your attractive patch will arrive shortly just by submitting your answers online. 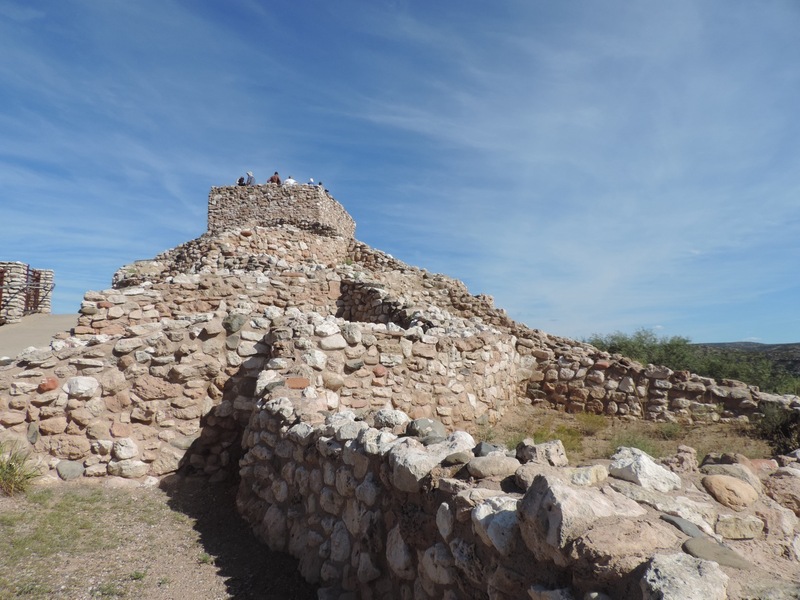 A small, but interesting site in Central Arizona highlighting ruins from almost 1,000 years ago. As part of the Verde Valley you cross the Verde River, year-round flow, as you approach this area. The surrounding views are spectacular. 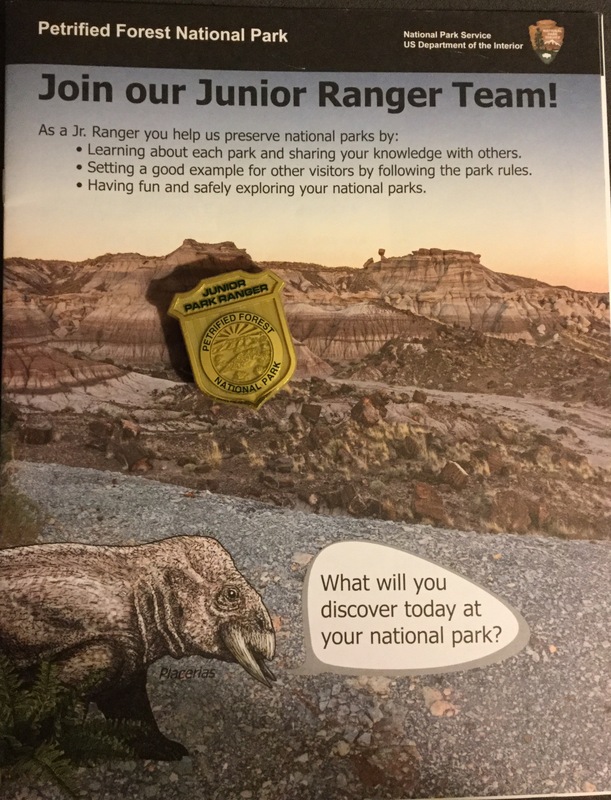 This Junior Ranger Activity Guide is considered Senior Friendly as there are three age groups; turtle symbol for 6-7 years old, sycamore leaf symbol for 8-9 years old, and macaw symbol for 10 years or older. I had picked up the booklet on a previous visit and was intrigued by the page titled “How many pots can you find?”. The visitor center contains museum-style cabinets full of pots. Counting them took concentration, as I would notice another one hiding under a shelf after moving on. My final count was 52, a number the staff told me was one of several numbers considered an acceptable answer. The discrepancies could be related to what is a pot? Once the count was complete you draw your favorite pot, mine was a corrugated jar, the coils had not been smoothed over creating a nice texture. Understanding the Clues allows you to study a real archeology report, on the previous page, then use clues to determine the answers. It was helpful to see the diversity of the pottery styles and to appreciate how the differences help you determine the age of a piece of pottery. It reminded me of Antiques Roadshow when they look at an item and can tell the owner when it was made. Walking the Pueblo Trail, a hilltop covered in ruins, was beautiful on this October day. Besides enjoying the ruins the surrounding views are stunning. 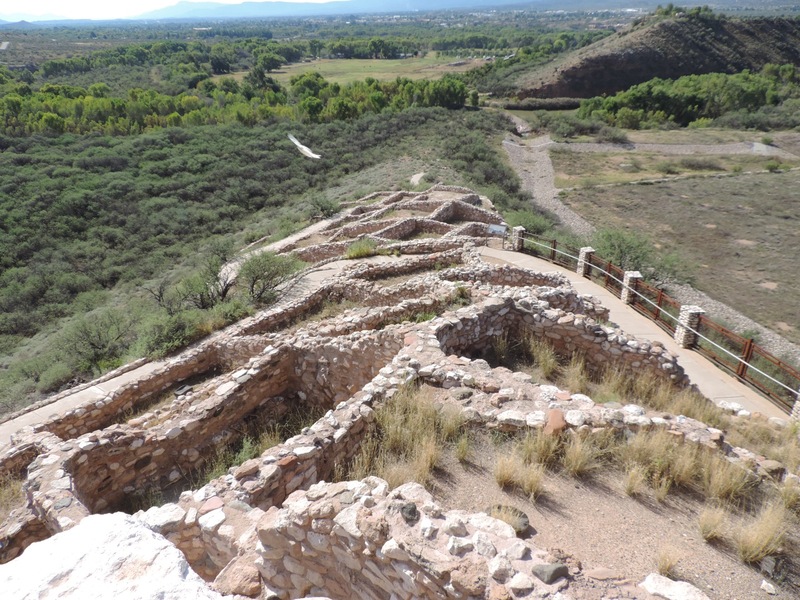 Tuzigoot is set in the Verde Valley, near the Verde River, hilltop mining town of Jerome and within view of the red rocks of Sedona. Sections of ruins were built over time, some as long as 900 years ago. After walking through the museum and then the ruins I was able to complete the activity guide. After a staff member reviewed the booklet I received the badge. I purchased the patch from the bookstore. The inside back cover of the activity guide contains the Certificate of Achievement.